Today during our morning planning meeting, we discussed what our remaining goals for the mission would be. Our first week was a constant barrage of learning new procedures (for science investigations adapted to this environment; for keeping ourselves fed, watered, and clean; and for keeping the Hab functioning). Now that we’ve found our legs in those regards, our attention has opened out to thinking more broadly about what we want to accomplish. And now there are just four days left of our mission! Brian has spent hours learning how his land streamer of seismic geophones works, so that he can deploy it to collect a seismic refraction profile of an intriguing inverted channel. Darrel has struggled to find time to work on his radio-controlled plane, which has a camera and could potentially be used for scouting good locations for on-foot investigations. Luis wants to culture and analyze the biological samples he’s already collected. 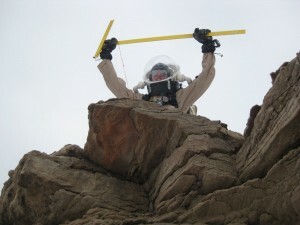 Carla wants to compile the results of her Mars Dessert Research Station efforts. I’ve been itching to get out and do some real geology, not just the tourist-geology I’ve accomplished so far (point and gasp and take pictures!). Of us all, Mike may be in the best position, having raised the radio telescope from 10 feet to 20 feet high early in the mission; he’s been happily collecting data ever since. After much discussion about what our remaining EVAs might focus on, Brian determined that his land streamer deployment likely would require a seriously long (like all day) EVA—or even two such EVAs. He also needed some more time to plan just where and how he would deploy it. So we decided that I would use today to do a two-ish-hour EVA with a geology goal, and Brian will aim to do a seismic EVA tomorrow. I jumped on the chance immediately. 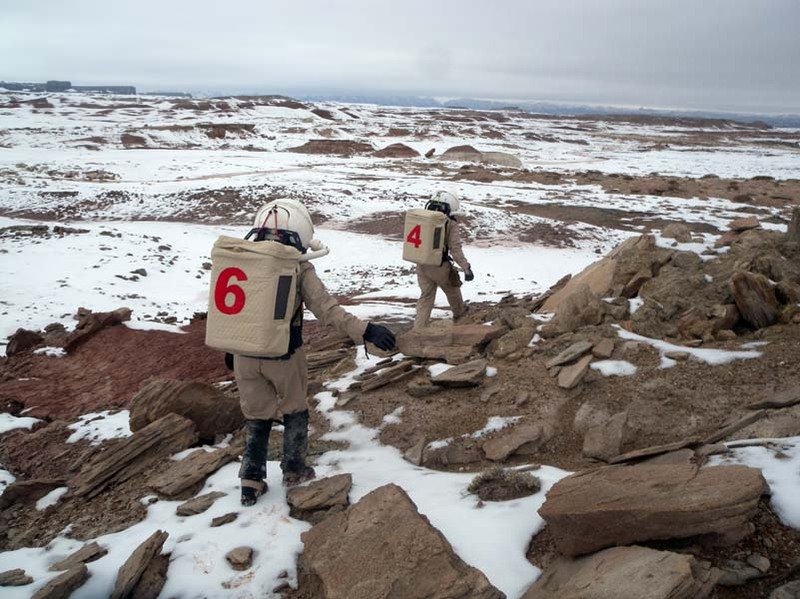 I wanted to find an outcrop and practice measuring a stratigraphic column in Mars-like field conditions (e.g., suit, gloves, helmet, etc.). From our crew’s previous EVA 8 to Candor Chasma, it seemed a likely place to find nice exposed layers. That crew had walked out to the Chasma, but we instead planned to drive up Lowell Highway to Cactus Road, aiming for the “Candor Chasma Access Parking” area, to shorten the trip. So after lunch, Carla, Mike and I suited up. 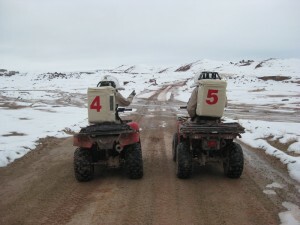 We exited the airlock at 1:45 p.m. and roared out on our three ATVs onto the “highway”, a moist concoction of snow and mud, but still quite drivable. 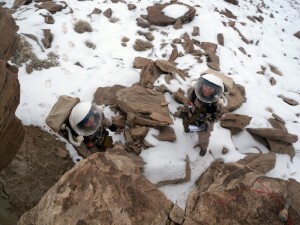 As commander for the EVA, I led the group, with a mirror strapped to my left forearm so I could glance back and check on Carla and Mike without turning around (which is very difficult in the suits, and would be very unsafe if done while driving). I checked my GPS unit every so often so that I would know when the intersection with Cactus Road was at hand. I’d pre-loaded the GPS not only with our final destination but also with some waypoints compiled into a “route” (my first exercise of this GPS capability). Everything went fine at first—but then we overshot Cactus Road. We turned around and headed back slowly. I could see the waypoint blinking at me on the GPS screen, but we just could not find a road or track of any sort heading east of Lowell, due to thin but obscuring snow cover. After some dithering and scouting expeditions on foot, we gave up on that goal. Instead, I decided that we would head north on Lowell until we found an interesting outcrop and just map that. 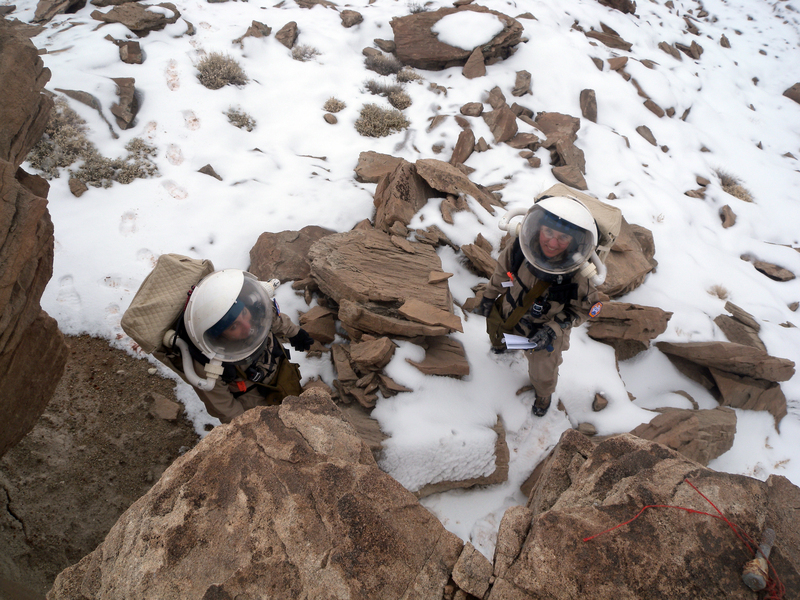 As we went north, I was anxious—as commander of the EVA, it was my responsibility to make good use of our time, and I was thrown off by the failure to find Cactus Road. Would we even see anything interesting to the north? 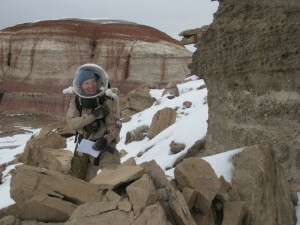 I’d been up there before on EVA 5 and only had a dim impression of lots and lots of soft, squishy, muddy Morrison Formation. I wanted solid rock with interesting structure to map. We clambered up to the Dakota layer, and I walked Carla and Mike through the process of identifying layers and noting them down on paper. It definitely was good to have multiple people there. I couldn’t see my own suit well enough even to get the pencil out of my shoulder strap holder. We didn’t have a Jacob staff or Brunton compass, so we made do with a T-square we’d found in the EVA room, which had been augmented with a plumb bob to aid in standing it straight up. We measured 13 distinct layers over 146.5 inches (the entire exposed section) and Carla and Mike took copious pictures to augment my hasty sketches. (Pencil, by the way, is highly superior to ballpoint pen in 36 F weather.) The layers were a combination of fine horizontally bedded sandstone, medium sand layers inclined about 30 degrees, and conglomerate layers with gravel and pebbles. Some of the latter seemed to have some inverse grading (finer grains at the bottom, coarser grains near the top), which can be created by debris (mud) flows, as opposed to deposition from water or air. We spent a good chunk of time at the outcrop, then toured around it, also noting an impressive cave that sat below our level, under a treacherous overhang composed of the same crumbly/poorly consolidated rocks. We kept our distance from the edge despite its undeniable allure. I found a chunk of gypsum buried in some sand, and we collect a couple of other small samples to bring back to the Hab. You can view the full EVA 16 information, including a map. We returned at 4:07 p.m. Now I’m sitting at the work bench, writing reports, and savoring having done some field geology, here at MDRS! I plan to make up a proper section (to scale, with composition, grading, and layering noted) soon… when I can find time. Whee! oh no you forgot to mention that the hydrochloric acid is a 37% solution!!! The devil is in the details! That 37% made this post! You guys are awesome, and I totally wish I were there with you all! Wendy, you have no idea just how present you are. Your name comes up on a daily basis! If only the webcams had microphones! 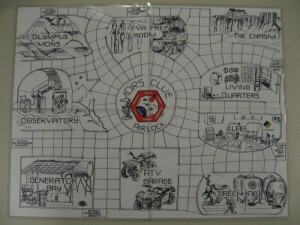 The Clue board is awesome. I suddenly realized I’m curious about the use of the term EVA. I know it’s a traditional space exploration term, but does the Hab really qualify as a vehicle? Wouldn’t EHA or something be more accurate? Evan, we actually debated that exact question a few days ago! 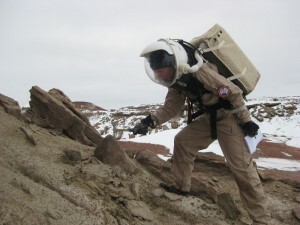 The Mars Direct scenario proposed by Robert Zubrin has the crew landing the spacecraft used to travel from Earth to Mars, and then using it as their habitat — which is a vehicle that no longer goes anywhere. So a crew might reasonably continue using EVA even after landing. However, there is disagreement amongst our crew about favorite terms for these expeditions. Darrel prefers “sortie” or “walkabout”, and Brian likes “field party.” Nothing as concise as EVA has yet been proposed. Ideas? EHA – replacing ‘vehicle’ with ‘habitat’ – is the only thing that immediately pops to mind. I love the Clue game, that’s very creative. And I’m thinking it would be a lot of fun to go on a hike with Kiri; her excitement over the geological finds sounds very infectious! Well, you made fun of me for playing air guitar with the T-square, so we even out… I’m still filtering through SURF stuff, and I think I have it narrowed down to four right now. I’ll probably have a decision tonight or tomorrow. Did you see the one on direct imaging of extrasolar planets? Cool! So unfair! Why do Caltech students get all the cool stuff? The ones you cite also look interesting. Hey, if you learn IDL, you can do more SCRIPTING!